Another year is upon us, and as usual, I’ve completely forgotten how much training and instruction goes into the simple rituals and routines that in May seem so commonplace. As I thought about what I could write a post about this week, I decided to focus on the little lessons that are essential, but easily overlooked, in a technology rich classroom. For those teachers just rolling out iDevice classrooms and for those like me trying desperately to get back into our own routines, don’t forget some of these important lessons. —Be Consistent . It is imperative that when teachers begin incorporating iPods or iPads into the classroom, that they only be used for education. The minute kids learn that they can get away with playing other apps, listening to other music, or searching other sites during instruction, they will take every advantage. I am very strict about my One and Out policy. I tell the kids in baseball they get three strikes; in iPods they get one. I will give you one warning about misbehavior with the iPods, and then you are out. I take the iPod, and you get book work or a worksheet on the same topic. It generally takes one or two kids being out, and I don’t have a single behavior problem again. But, the kids have to know you are serious and consistent. Create a function button anchor chart for easy reference. Include the video/music function buttons as well as other common icons for your class. —Teach Function Buttons. I assumed that all kids know which button is play and which button is pause. Turns out, this is not always common knowledge. On the first day you use a podcast, video, or music, be sure to plan time to review the function buttons (rewind, fast forward, play, stop, pause, and record). 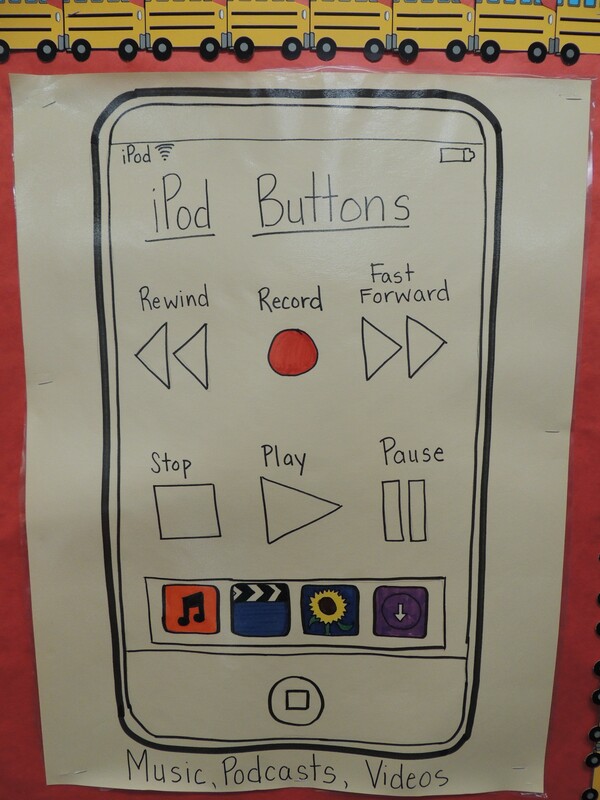 For younger grade levels, create an anchor chart for easy reference of the function buttons. —Never “Play.” A teacher doesn’t ever plan to just “play” at school. Everything you do has educational relevance. The same should be true of the times you plan to use the iPods/iPads. I never refer to the kids “playing” on the iPods, and my students never ask to “play” on them. We “use” the iPods, we “explore” with the iPods, we “learn with” the iPods; we never “play” with them. —Plan a Free Explore Day. Kids will be kids. We know this, so we need to plan for this. Avoid the inevitable fight when the kids go off task and start using the apps by planning a free explore day. Plan for and lead a day where the kids get a chance to use a variety of apps and give them a chance to do a little exploring on their own. Go into the free explore day with a handful of apps you think the kids will love and actually teach them how to use them. After making students independent at the use of these handpicked apps, you can trust that if you ask early finishers or small group stations to work with a particular app, they’ll know how to and won’t need additional instructions. Don’t forget to give the students some time to explore the apps on their own. They are going to do this eventually – you might as well plan a time to do it, instead of having them free explore in the middle of a lesson. I love, LOVE, teaching with iPods and iPads. Part of why I love it is because of how smooth my classroom runs and how little classroom management I have to do when I have the devices out. This ease of use comes with practice of our routines and procedures and consistency all year long.